Drusillas has kicked off our festive celebrations in spectacular fashion! The girls and I took our friends Amy, who writes at Bean Musing , and her daughter along on Saturday to join in the fun. 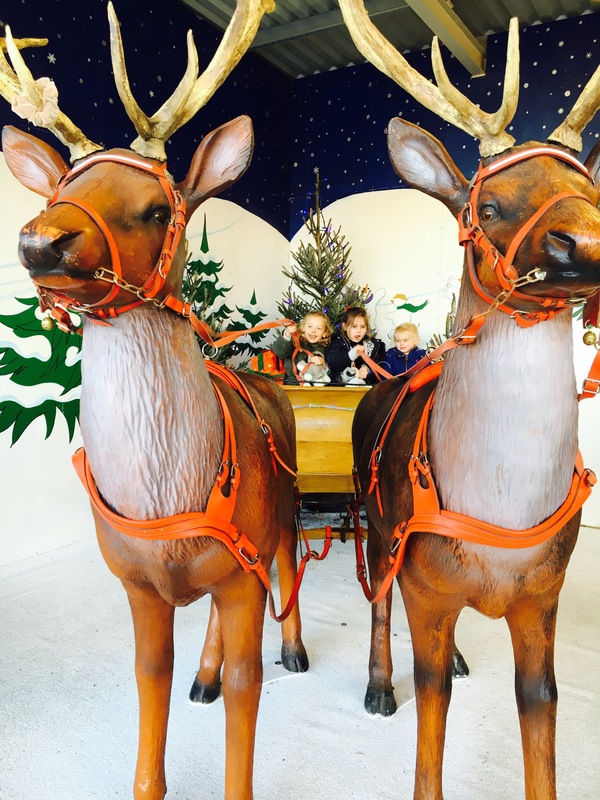 We headed straight for Father Christmas’ cosy cottage, why wait?! We were met by Mrs Christmas and her elves before being taken into meet the man of the moment. I think at this point I was probably more excited than the girls. 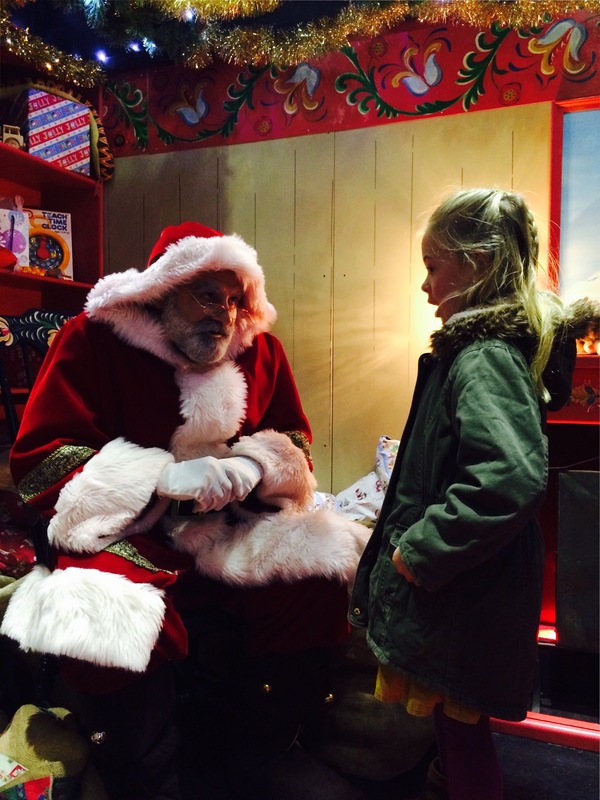 Each time we have taken them to meet Father Christmas I always get embarrassingly emotional! I probably need to get a grip, but I can’t help but wonder at their little faces. They are totally in awe of this movie star figure, sitting right in front of them. Despite of course, my toddler repeating that she didn’t want to go anywhere near Father Christmas and that in fact, she would be perfectly fine standing right next to the door thank you very much. The elf and FC made a great team and looked like the real deal. There were no fake beards and cheap suits here: right before our eyes was a miracle on 34th Street Santa. I just managed to stop myself muttering “I believe”. “Is he real?” whispered Darcie. Did I mention that the gift is gorgeous?! The girls were thrilled to reveal a cuddly Husky dog, just like the ones they were about to meet in the real. They didn’t let go of them for the rest of the day. It makes a nice change to have a decent, good quality Santa gift. I don’t mean that in an ungrateful way, but we have paid through the roof for some SuperTat in the past. The Husky dogs and reindeer had taken up residence right next to the huge sleigh scene in the beautifully decorated festive square. 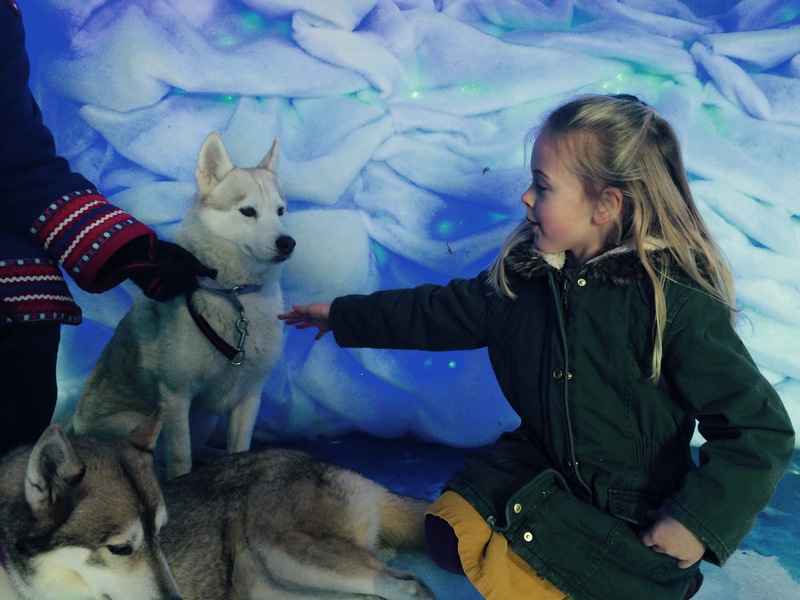 We were able to go straight in and cuddle up with these gorgeous Husky dogs before looking in on Donner and Dasher who seemed right at home being the center of attention. We had coincidentally just arrived as the penguins were being fed. Despite my frozen toes we decided to stay and watch, and I’m glad we did. Not only because the Penguin keeper was lovely and very knowledgable about her water babies, but because of what came next. A silence came over the enclosure as the keeper invited one of us 8 in the audience to, “Ask the question”. before we had a chance to exchange confused glances, the man standing next to us proposed to his girlfriend! Thankfully she said yes, their 2 children clapped, so we all clapped, with open mouths, min you, the penguins couldn’t have given a monkeys! What a moment to share, huge congratulations to them. Could there be a Drusillas wedding on the cards?! Back to the order of the day, and laden down with chips and hot chocolate we really got into the festive swing of things as the square came to life. Some of the best known christmas classics, filled the square, whilst the lights dazzled. Polar bears shone, ice caps sparkled and reindeer twinkled brightly. 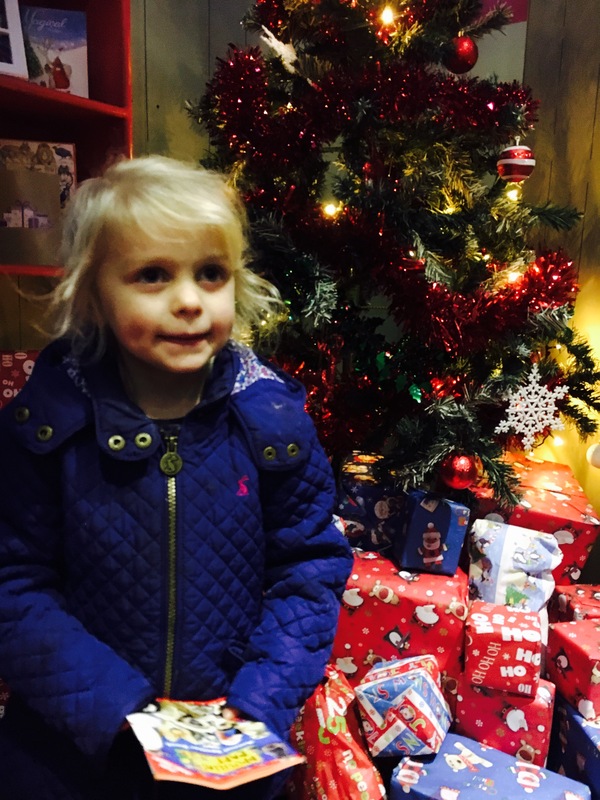 We couldn’t help but smile, sing and bop along with our little girls. It really did look beautiful, and yes, I may have welled up a little bit more – I can’t help it! 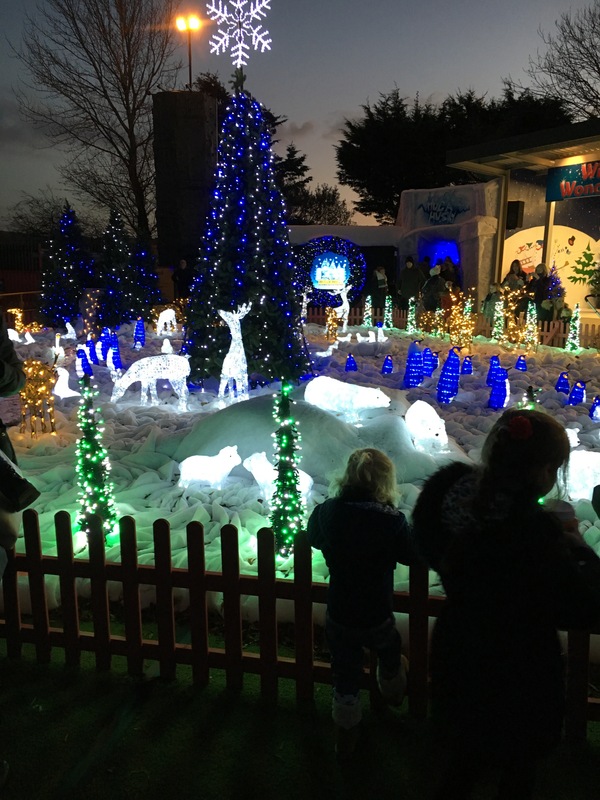 Drusillas is a truly great day out at any time of the year, but especially at Christmas. They have pulled out all of the stops this year to get you in the festive spirit. Don’t forget the Zoo, Hello kitty rides, the vast adventure playgrounds, indoor play, Thomas train ride, and the Maze are open for you to explore as usual! For a moment I thought you meant you’d like to live closer to me! Pahahaha! Drusillas is really lovely, we are so lucky to have it on our doorstep!